Banners can be used in many different ways – as a table cover, to hang on a wall, from a ceiling or you can put them on a banner stand. Temporary, portable signs can be made from an assortment of materials including chalk boards, dry erase panels and more. A great way to provide information to customers and employees on a job site, at a development or for your property. You want your signage different from your competition. Our signs are high in quality, presentation, creativity and professionalism. In the air, on the ground, and everywhere in between, your signage continues to impress as it promotes your business. You’ll likely find one of us here! On December 1, 1992, Sign Pro opened their doors with a dream, one computer and NO cell phones. 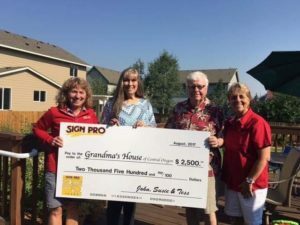 Sign Pro would like to “high-five” their loyal friends and customers because it could not have been achieved without them. 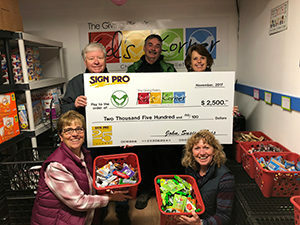 Since its start, Sign Pro has felt a responsibility and desire to give back to this wonderful community where they feel very lucky to live and do business. 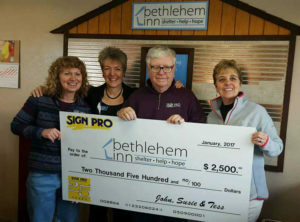 So, to celebrate this milestone, Sign Pro has donated a total of $10,000 to four very worthy causes in Central Oregon. 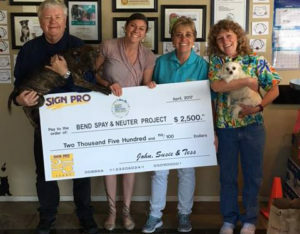 A donation of $2,500 has been presented to Bethlehem Inn, Bend Spay & Neuter Project, Grandma’s House and the Giving Plate. John, Susie and Tess say Thank You for 25 Years and they are NOT done yet. They value your patronage and friendship and are very proud to be a community partner. Over the years we’ve grown substantially, but the values and principles with which we began have served us well in our efforts to be a valuable asset to our community and to your business! Visit Sign Pro today, or give us a call at 541-382-7446. We’re here to serve you with the same professionalism and performance that we have exhibited for 25 years. If you need a sign, banner, digital printing, magnetics or any of our other fine solutions for business or personal use…we’ll be here to help you through every step of the process. We have made a conscious effort to make sure that we have the latest technical equipment advances in the sign business. That coupled with our goals of outstanding customer service make for a company with whom we hope you will want to do business. 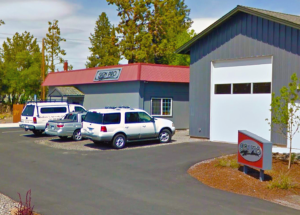 Visit us at 512 SE Glenwood Dr. in Bend.